This beautiful eBook contains short stories from a bunch of local talented authors I met at a WEA creative writing course (and my own story ‘The straight and narrow’) I will be attending the official launch tomorrow night (Tuesday 8th April 2014), 6pm at WEA Hall in Cooks Hill. The long awaited collection, Mirrors, will be published tomorrow night! The authors have put up their feet now, and so can you while you enjoy the read. Here’s a taste of what you’ll find inside the cover. 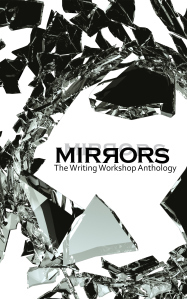 Mirrors is an anthology of short stories, creative non-fiction and poetry from nine Australian writers. Set in cities, suburbia, and the Far North these authors explore the desires, the humours and the sorrows of life. Congratulations Jessie. You are doing so well. So proud of you. Thanks Dad! It means so much to hear that from you. Love you and looking forward to coffee tomorrow! Look forward to seeing you there Jessie. This promises to be a lovely ebook, showcasing some talented local authors.